Grab all your gum drops and your peppermint sticks, your gingerbread recipe and your little bag of tricks! 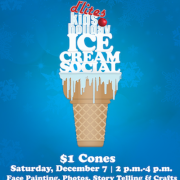 Join us for a Kids Holiday Ice Cream Social on Saturday, December 7 from 2-4pm. Complimentary face painting, story telling, crafts (first come, first served!) and $1 small cones for all, plus our in-house photographer will capture the fun to share with you on Facebook! And… furry friends are welcome too! Our little way of saying Thanks! for a great year, and get in the holiday spirit without breaking the bank.